America’s independence day is around the corner and one of our family favorites for 4th of July celebrations is potato salad. I usually use Russet potatoes for my salad but this time I experimented with Yukon gold potatoes instead. I’m happy to report that I really liked the flavor and texture it added to my otherwise simple recipe. The smoked paprika also added great depth of flavor. Try it and let me know if you feel the same as I do. Wash and boil potatoes in salted water until they are tender when tested with a fork. Drain, cool, peel and chop into bite sized cubes. Place the eggs in a pot and cover them with cold water. Once the water comes to a boil, cover the pot with a lid and turn off the heat. Let it sit for 15 minutes. Cool, peel and chop them into bite size pieces. In a large bowl, combine the potatoes, eggs, cornichons, green onion and celery. Add mayonnaise, salt, paprika, and black pepper. Gently stir so that it coats the potatoes, eggs and other ingredients evenly. Refrigerate for at least three hours to allow the flavors to blend. Serve cold or at room temperature. Last year I visited my brother and sister-in-law in Thailand. The food was incredible and they made sure that I had an opportunity to taste everything. The only fruit I didn’t taste was durian. Maybe next time! I thought I would share with you a Thai inspired salad. It’s 100% vegetarian – no fish sauce. The dressing is easy to make and my family loved it. I use maple syrup which gives the dressing an unusual flavor. It’s a great companion to your favorite fiery Thai dish, but compliments non-Thai dishes as well. Put all the above ingredients, except the peanuts, in a large salad bowl. The recipe for the cilantro and lime dressing is given below. Blend lime juice, sugar, maple syrup, cilantro, garlic, salt, pepper, and olive oil in a blender until smooth. Remove the dressing into a small bowl and stir in the grated lime rind. 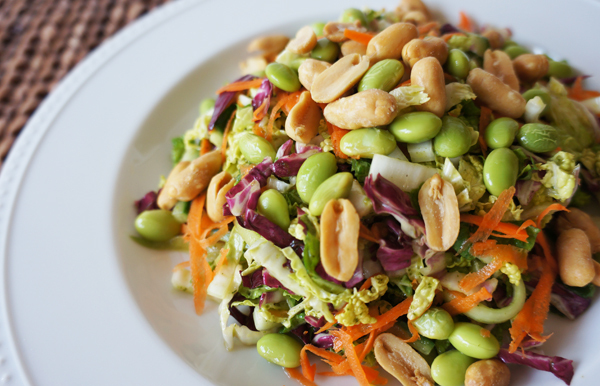 Top each serving of salad with two tablespoons of dressing and garnish with roasted peanuts. Serve the remaining dressing on the side, because people always ask for more!